Nope, my little boy didn’t give me those flowers because (1) he’s too young to order flower delivery online and (2) he didn’t have money to buy those beautiful flowers. But I’m sure he would love to surprise Mommy with a lovely flower bouquet because he is such a sweet boy. 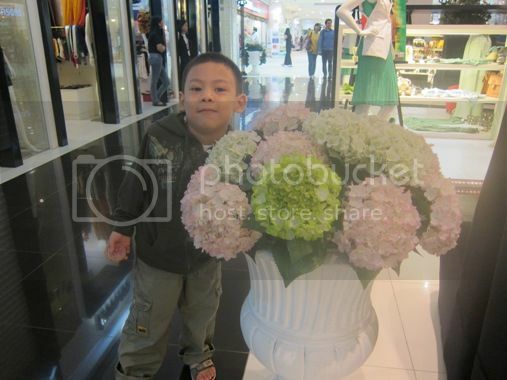 That photo was taken at 50th Avenue in Robinsons Galleria before Christmas last year. I had my point-and-shoot camera then, the background was perfect, and the little boy gamely posed for this impromptu photo shoot. This entry was posted in Flower Delivery, Flowers. Bookmark the permalink. 2 Responses to Flowers for you, Mom! ← Unilab Run United 1 2012 Is Happening Soon!